Investing in the stock market can take a toll on ones emotions. After all, it is commonly said that the stock market is led by 90% emotion and 10% reason. While education is a great way to help decrease this emotional pull it does not always provide a matrix through which you can make investment decisions. This is where an investment plan comes into play. An investment plan puts meat on the bones of your investing goals and simplifies your investment decisions. I found that early in my investing life I was simply throwing darts hoping to hit something good and be able to rack up some solid wins. Looking back, I realize that was aimless investing; it gave me no real way to manage my returns. A number of years ago I was introduced to the idea of having an investment plan and have not looked back since. I’ll not get into the details of how specific an investment plan should be, but it is basically a written plan dictating what types of investments you are looking for (sectors, industries, profit margins and the like) along with a quantifiable number you are comfortable losing. If you’re like me, when you buy a stock or ETF you intend on holding it for some time. When I research a stock, I intend to hold it for a while, but I never intend to hold it forever. An investment plan helps you know when the time is right to sell a stock. Before I had an investment plan I sold when I felt like it or when I thought the stock had run its course. That approach leaves much to chance; in the end, no decision made in a vacuum is perfect. Having a written investment plan helps make the decision to sell a stock easier for you. When I buy a stock now I decide how much I am comfortable losing on it and set a stop loss order at that amount. The typical amount is in the 10-20% range and I set the stop loss order at that. If the stock goes up (as I hoped it would) I then readjust the stop loss order to continue to trail by the chosen percentage. This takes the emotion out of selling and am now guided by the numbers rather than fear of losing my shirt. If you’re involved in online investing, you either need to be near a computer or have a smartphone in order to place a trade. Just imagine if you’re on vacation and one of your stocks takes a nose dive and loses 30% over the span of a few days. If you did not have a stop loss order in place then you’ve taken a bath with everyone else. However, if you did have a stop loss order in place you’ll likely have gotten out much sooner, limiting your loss to an amount you’re comfortable with. Using stop loss orders in conjunction with your investment plan is a sound way to manage your portfolio and hopefully limit losses over time. This also will help you stay away from the “click and hope” mentality that is often found in retail investing. We’ve all heard the term “Buy Low, Sell Hi”. The problem is that many times it’s the opposite that happens. We get fearful of what’s going on and jump ship to avoid further losses. The problem is that many times the stock comes back and if you bailed out then you’ll miss out on some decent returns. This also works the other way, and did for me recently. I recently was holding an Apple call contract that gave me the right to buy 100 shares at $650. I made a very nice profit on it, but because I did not follow my investment plan I lost out on another $1,000 that I could’ve made in my retirement portfolio. I did not follow my investment plan and let fear be my guide. This ended up in me getting out of the option and missing out on the increased return. While the profit I made was quite sizable, I could have made more if I would’ve followed my investment plan. In my years of speaking with investors, I have always been surprised by the number of people who don’t look at their portfolio as a whole. I realize that a 401k is separate from other outside investment accounts you might have, but the simple fact is that the parts make up the whole. By not looking at it that way, you risk being either over diversified or being overly concentrated in just a few sectors, stocks, etc. This is where an investment plan will help you. It enables you to look at your investment portfolio as a whole in order to make sure you’re properly diversified without focusing too much on one area that might end up causing you problems in the future. 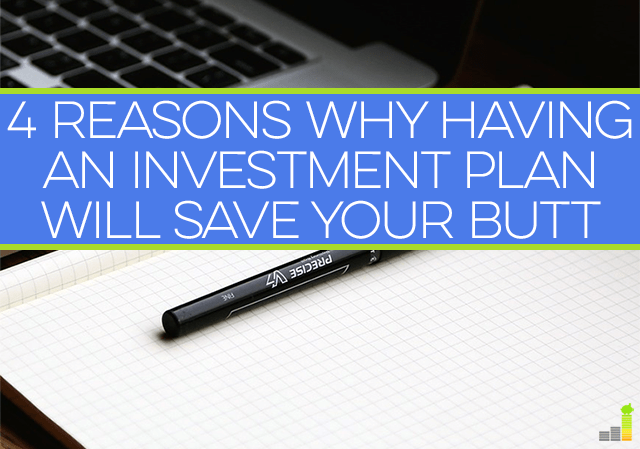 Do you have an investment plan in place or is this the first you’ve heard of it? How much are you comfortable losing on an investment? That’s very true Jose. 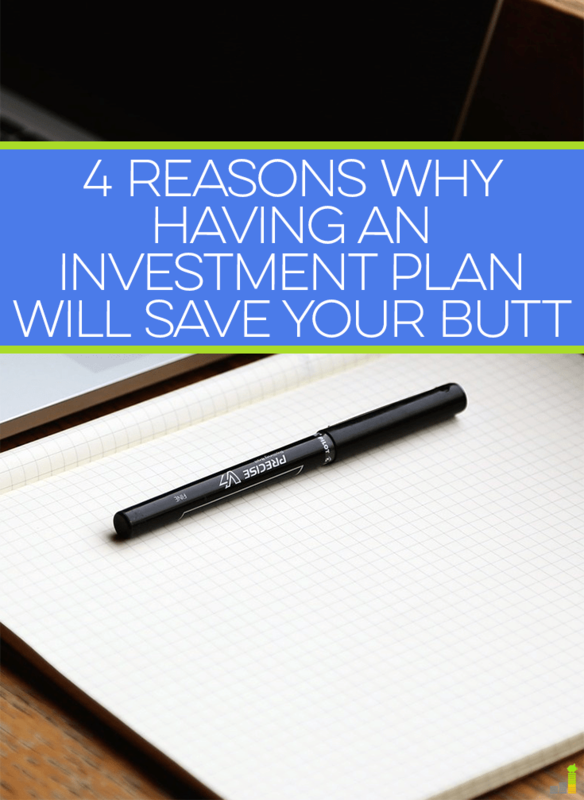 This is the very reason why I think having an investing plan is vital. Emotions can be a powerful thing and when they get mixed in with your investing it can lead to potential failure. John, thanks for the informative and educational post. As we work our way out of debt, we are also making plans for how we will increase our wealth once the debt is gone. We knew we wanted to invest, but our current “plan” is much like your plan was in the beginning. Now we’ll know how to invest the smart way – thank you! Not a problem Laurie! I think that in the long run education is king. Many people get caught up because they’re not experts, but you don’t have to be in order to do well in the market. There’s so much available that a little bit can take you a long way. I have a very loose investment plan that I try to keep to. It is pretty much about diversification between stocks, property and commodities. Sounds like you have a good plan going Glen, as well as diversification. I invest in index, so they are supposed to go up eventually. Putting a stop loss may trigger the order before it goes up again. With currencies I definitely put stop losses, just below pivot points so a temporary bump doesn’t trigger the stop loss but a big dip does. That’s a good point Pauline, that can be tricky. I view stop losses as more of a necessity with individual stocks though and not with index funds. I’ve never invested in currencies, but know that they’d be a huge help with them. Having a plan and sticking to it are two different things. You need to have gone through a few boom and bust cycles to see how you handle these things. Of course having a plan will help. My old plan was to keep buying no matter what and that works out well enough. Now that I don’t have as much money to buy, I’ll have to be a bit smarter. That’s a good point and one that we all struggle with sticking to at times. The key, I’ve found, is to not jump ship during those cycles. If you do jump ship then you miss out on the uptick that’ll eventually come. Great article John. Whenever I get someone telling me they want to shift their money out of investments such as their retirement accounts I explain to them that when the market is down it’s the best time to be in because everything is on sale. If they were to pull of a bad market the loss would realized for sure. Finding the right level for a stop loss order is key. Set it too low and you’ll take a big hit if the stock nosedives, set it too high and you risk losing money on a freak short term market swing when you might rather have kept the stock. That’s a very valid point Adam! It can be tricky to determine that, especially if you’re new to investing. I like to use them when I am on vacation or now that I’ll be away from my computer for days at a time. Personally, I prefer using trailing stops. Especially if you think the stock has more upwards potential but are in conflict with protecting your gains. I have a post in the pipeline focused on stop loss orders, it’ll probably publish late next week. Look for it as I’ll be explaining how I use them not only in my long term portfolios but how I’ve used them in the past as part of a trading strategy. Trailing stops can be a great tool to use Jose. However, in my years of working with retail investors way too many do not understand them and quite often get sold out when they never intended to. A lot of it comes from lack of knowledge with the best use of it. When I use stop orders I like to be able to manually track it and adjust it as need be. Since I am relatively new to investing, I never knew about Stop loss orders. This is something that I want to check on in order to stave off any bad stocks that are in my portfolio. Thanks for the insight John and now I have another thing that I have to do. Thanks! I haven’t ever done a stop loss order. Individual stocks still scare me a bit, so I tend to buy mostly index funds to hold. When I get more brave and have more money to invest, it would be something to consider, but honestly, we’ll probably buy another rental property instead of putting it in the stock market. I totally understand that Kim. Index funds are great, especially when you’re more of a buy and holder. I’d love to get into real estate, but I lack the knowledge and time to devote enough to it. I agree entirely. One of the things I did as I moved into dividend growth investing was to establish a rough investment plan. It outlined what criteria I would look for in a stock in order to buy or sell it. As my investing knowledge grew, I expanded the plan and built up more guidelines. That’s basically where I am at. It started out very basic and continue to grow and add to it over time. It definitely helps to have it in order to give greater confidence in decision making. I haven’t invested in stocks yet. I wanted to a few years ago but didn’t. I can see how someone could get scared though and then possibly miss out. Right now our money is invested in real estate and oil & gas, and the investments are long term. It can be scary, especially when you’re just starting out at it Sicorra. It’s all in what you know and it needs to be at the right time. I’d love to be more diversified and be in some of those things you’re invested in. To be honest, I simply don’t look too closely at my investments. Although the first stock I ever bought was a penny stock for a company I once worked at. It’s the only publicly traded company I’d ever been at. However, I apparently bought high (at 25 cents per share) and now the price is worth about 1% of that. Makes me glad I only bought 100 shares and it was more to say I owned a piece of the company than to make money. Ouch! Thankfully you’re only out $25 on the penny stock. That’s one of the main reasons why I never buy penny stocks. Can’t argue with that logic. As a project manager, i know that planning is half the battle to success. Also, love the picture. I stood there 2 weeks ago and took the same photograph. Broad street is a pretty cool place. That’s just it Jason. Without planning you’re leaving yourself wide open to plain chance. That’s a great approach to take Marvin! All too often retail investors get caught in that trap of waiting for the stock to come back and it almost never does. I know I have done it in the past, but don’t plan on it again. Knowing your risk strategy is very vital as well. I actually think one of the things you are talking about is having an investment policy statement more than a plan. What guidelines do you set when you begin investing your money. Without a pre set well defined guidebook then what your left with is your emotions making most of the decisions. Think about how many people still hold Apple and aren’t sure what to do even with the downturn. This is where emotions will get the best of you. Thanks for your comment Ted. However, you’re incorrect in thinking that I am writing about a policy statement. It is a written out (digitally) plan of numerous things that I look for in an investment, rules I plan to follow as well as rules to follow on a potential sale. The reason why I did not go into that, as I had indicated early in the post, is that I did not want to bore readers with a 3,000-4,000 word post and will be covering the topics in future posts. I could not agree more in terms of emotion and keeping it separate from investing. I’ve written extensively about it and in my working with retail investors in the past I know the toll it can take on your investments. I completely agree with you on the necessity of looking at your investments as a whole. I think, however, this should go even further and beyond your investment. I have read Nalebuff’s and Ayres’ work and they claim that you should include your life time salary to your overall picture. If you have let’s say 50k a year salary, then it is similar like having bought a 30 yr bond at total $1,500,000. (30x50k) and you are receiving 50k yearly coupon from that bond. If you have saved 100k so far and have everything in stocks, you still are very underallocated in bonds and only have 6.6% invested in stocks( 100k/1,500k). A completely different picture, right? I enjoyed reading your post. How do I develop an investment plan? Where is the best place to start? Is there a process (website, book, DVD) that you would recommend? Something that outlines options for a beginner?